Use the form below to inquire about Leisure Villa Stay at Dolphin Bay in Nerul-Goa . Use the form below to reserve for Leisure Villa Stay at Dolphin Bay in Nerul-Goa . This is the largest room in the resort. Located on the first floor of the Leela Villa, it offers spectacular views of the ocean, comes with a separate sitting and living area, a bedroom with a king size bed and two private balconies. You can also see the Sunrise pool and garden from this suite. This room is located on the ground floor of the Sunrise Villa, has a queen size bed and a curved brick ceiling and offers spectacular views of the ocean. This room is located on the ground floor of the Sunrise Villa, has a super king size bed and a loft which can accommodate a child .It offers spectacular views of the ocean as well as the garden. This room is located on the ground floor of the Sunset Villa and has a super king size bed and laterite arches. It has large windows that overlook the bay. This room is located on the first floor of the Sunset Villa, has a queen size bed, a spacious private terrace and also a step out balcony which offers spectacular views of the ocean. This is a cozy corner room located on the first floor of the Sunset Villa. It has a queen size bed and a private balcony which offers spectacular views of the ocean as well as the Sunset Villa pool. Perched away among the branches of a 200 year old banyan tree, this room is in the Arjun Tree Tower and has a queen size bed. It offers views of the ocean from the tree top terrace. Change your perspective of travel with the Leisure Villa Stay at Dolphin Bay in Nerul-Goa. The Leisure Villa Stay at Dolphin Bay in Nerul-Goa allows you to take a break from your hectic routine and embrace a relaxed lifestyle in an elegant Goan holiday dwelling. Located far from the cacophony typical of cities, yet close to happening haunts, this place will be etched in your memory long after your holiday is over. The quiet Dolphin Bay offers a private escape with scenic views of the sea and the serene surroundings for company. While it’s hard to ignore the faint sound of the crashing waves, the accommodation at the Leisure Villa Stay at Dolphin Bay in Nerul-Goa adds to the surreal charm of the quaint property. There are nine rooms spread across three villas that feature traditional architecture with tilted tiled roofs on red sandstone walls. The understated elegance and attention to detail are evident in each of the rooms in the Leela Villa, Sunset Villa, Sunrise Villa, and also Arjun’s Tree House perched on a banyan tree. The Leela Villa features a living room on the ground floor and the Trinidad Suite, the largest room in the hotel, on the floor above. The suite has a balcony that offers views of the Arabian Sea from all angles. The Sunset Villa has a common living room and four rooms with individual bedrooms. Each of the four rooms is well-furnished and tastefully decorated. The Sunrise Villa has three well-appointed rooms, a dining room, and a sit-out veranda. What the leisurely stay by the sea does for your soul, the food served at the hotel will do for your appetite. The Al Fresco dining at the Leisure Villa Stay at Dolphin Bay in Nerul-Goa will awaken the gastronome in you. Choose from a wide spread of Goan, French, and Italian cuisine. Don’t forget to try the seafood on the menu as it’s made with the fresh catch of the day. For children (5 - 15 years)-Extra mattress in the same room at Rs.3500/- (exclusive of GST) per night. For 15 years and above- The cost for the extra mattress is 35% of the room charges. For maids accompanying guest, extra mattress in the same room as the guest and all 3 meals @ a special price of Rs. 800.00 per night + GST currently as applicable 28% are extra. The property is closed from 15th May 2018 through 17th June’18 for their annual monsoon maintenance. It re-opens from 18th June 2018 onwards. A minimum 2-night stay has to be booked. In exceptional cases, guests will be accepted for a single night’s stay at a premium 50% surcharge. An advance deposit of 50% is required to confirm a reservation. A 100% deposit is required at the time of booking to confirm reservation during Diwali, Christmas, and New Year. A “corkage” fee of Rs. 1000 will be charged per bottle for alcohol purchased from outside the hotel. Friends of the hotel guests are not allowed on the hotel premises. Outside food is not allowed in the hotel. There is no room service as the consumption of food and drinks is strictly prohibited in the rooms. Eight weeks before check-in: 100% refund of deposit and any pre-paid amount. Between 46 and 55 days before check-in: Forfeit of 100% of the pre-paid and refund of the balance payment. Between 30 and 45 days before check-in: Forfeit of 100% of the pre-paid deposit. If full payment is made, 50% of the total cost will be refunded. Between 10 and 29 days before check-in: Forfeit of 100% of the pre-paid deposit. 25% of the total cost will be refunded in case of full payments. Reducing the number of nights in this period will incur 50% of one night’s charges. Between 1 and 9 days before check-in: No refund. Reducing the number of nights within this period will incur one night’s charges. Start your day with a stroll in the hotel’s gardens landscaped to perfection and dotted with lush greenery, which includes exotic tropical plants and colorful flowers. You can then head out to sea with the boatmen and try your hand at fishing in the Dolphin Bay or catching crab in the Sinquerim River. Once you’re back on land, you can visit the churches of Old Goa, forts, museums, and other heritage sites to get a glimpse of Colonial Portuguese architecture and the rich history of the region. When in Goa, it is a mandatory ritual to visit at least one of the many beaches that dot the coastal state. Located at an approximately 50-minute drive away are the less crowded beaches of Ashwem, Mandrem, and Morjim. While you enjoy the sun, sand, and the sea, you could also indulge your taste buds in the delicious fare dished out by the many cafes, restaurants, and shacks lined at these beaches. Take a dip in one of the two pools that add to the cool air circulating all over the property. While the Sunrise infinity pool is the perfect place for a morning swim or a leisurely afternoon dip, the Sunset plunge pool is the right place to catch the golden sunset under the shade of the swaying coconut trees. The hotel also has a spa called the Banyan Spa, where you can choose from a variety of therapies and massages to rejuvenate your mind, body, and soul. For air travelers, the nearest airport is the Goa International Airport (33 km) at Dabolim. Mangalore International Airport in Karnataka is about 380 km away from the property. Those who prefer train journeys can take a train to Vasco da Gama (33 km). The railway station at Madgaon (44 km) is another option for railroad travelers. The road from Bangalore passes via Hampi, which makes for an exciting road trip that covers about 560 km. The place is connected to Mangalore in the South (355 km) and Mumbai in the North by NH 66. 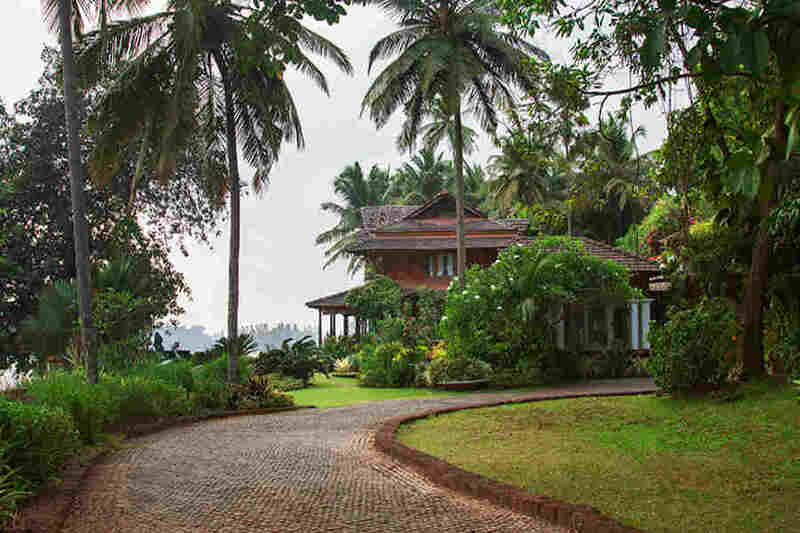 Towns close to the property include Panjim (11 km), Mapusa (16 km), and Margao (42 km).